The Marathon Classic presented by Dana is the tournament played in the Toledo, Ohio, area that, until 2013, was always associated with the actor Jamie Farr. From its founding in 1984, the tournament was called some version of "Jamie Farr Toledo Classic" or "Jamie Farr Owens Corning Classic" until, in 2013, Marathon Oil entered as the title sponsor. At that point, Farr's association with the event ended. The Marathon Classic is a 72-hole tournament on the LPGA Tour schedule, played during the summer months. Thidapa Suwannapura of Thailand defeated major championship winner Brittany Lincicome in a playoff to claim the trophy. Suwannapura rallied in the final round with a 65, tying Lincicome at 14-under 270. On the first extra hole, Suwannapura won it with a birdie to Lincicome's par. It was the first career win on the LPGA for Suwannapura. In-Kyung Kim fired a final-round 63 and cruised to a 4-stroke victory. 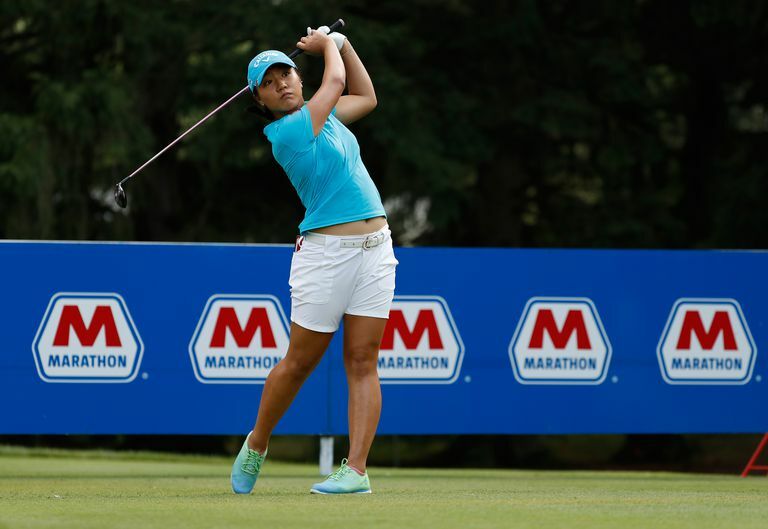 Kim finished at 21-under 263, four strokes better than runner-up Lexi Thompson. Third-round leader Nelly Korda, an LPGA rookie, shot 74 in the final round and finished tied for eighth. For Kim, it was her second win of the 2017 LPGA season and her sixth career LPGA victory. Note that during the tournament's time as a 54-hole event, the best 54-hole winning total was Brandie Burton's 201 in 1993. The event is played at Highland Meadows Golf Club in Sylvania, Ohio, on the northwestern edge of Toledo. Highland Meadows has been the tourney site since 1989. Prior to 1989, the first four tournaments were played at Glengarry Country Club in Toledo, a track now known as Stone Oak Country Club. Se Ri Pak is the queen of the Marathon Classic, winning the tournament five times. Pak's first victory here was in 1998, her rookie year on the LPGA Tour. It was the third win of her LPGA career, following major championship victories at the LPGA Championship and U.S. Women's Open. Pak's winning score in 1998 of 261 was, at that time, a tour record for lowest 72-hole stroke total (that record has since been surpassed). Pak's five victories at this tournament ties the LPGA record for most wins in the same tournament. Mickey Wright (Sea Island Open) and Annika Sorenstam (Samsung World Championship and Mizuno Classic) also won the same tournament five times (twice in Annika's case). The tournament has skipped two years in its history since debuting in 1984. No tournament was played in 1986 or 2011. In 2011, the Jamie Farr Toledo Classic was skipped so that the tournament staff could focus on the U.S. Senior Open that was played in Toledo on dates close to this event's dates. The Farr began as a 72-hole tournament, switched to 54 holes from 1989-1996, went back to 72 holes in 1997 and has remained 72 holes since. Aside from Pak's five wins, the other multiple winners here are Lydia Ko, Penny Hammel and Kelly Robbins, each with two victories. Paula Creamer won the 2008 Jamie Farr Toledo Classic after opening with a first-round 60. Only Sorenstam's 59 at the 2001 Standard Register Ping is a lower round in LPGA history. On one of her nines during that round of 60, Creamer carded a 27, which ties the LPGA record for lowest nine holes. The last of Meg Mallon's 18 LPGA victories happened at the 2004 Farr. So Yeon Ryu's 2012 victory was highlighted by the 62 she shot in the final round. That score tied the LPGA record for lowest final round by a winner, shared by Juli Inkster, Annika Sorenstam, Mickey Wright and Kathy Whitworth. The tournament name changed to Marathon Classic beginning in 2013. Actor Jamie Farr, a Toledo native, was a tournament booster throughout its history up to that point, and had his name in the title in previous years. Farr played the role of Klinger on the hit television series M*A*S*H in the 1970s and 1980s, and served as tournament host until retiring from those duties prior to the 2013 event.